Potato Bob – What a guy!! 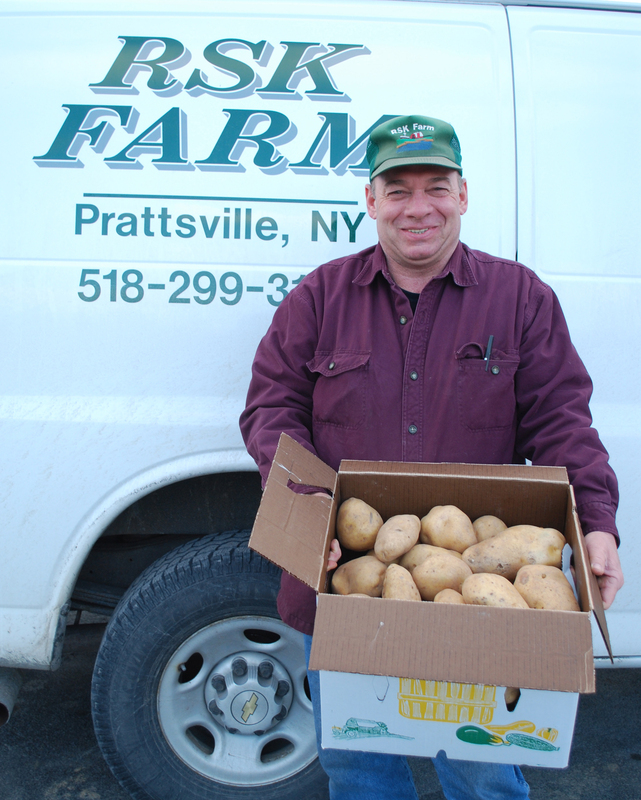 We always welcome our weekly delivery of potatoes from the guy we affectionately call “Potato Bob” (aka Bob Kiley) from RSK Farms in Prattsville, New York. In the winter months Bob draws from his store of carolas and fingerlings that were harvested last fall. Now that we’re nearing spring he’s getting ready to start planting all over again. I asked Bob what he has planned for this year’s growing season and here’s his list: Carola, Red Norland, Green Mountain, Adirondack Blue, Adora, two types of fingerlings = Russian Banana and Laratt, Austrian Crescent, Rose Finn Apple, New York 118, and Keuka Gold. And that’s just potatoes! This spring he’ll begin planting my personal favorite mesclun salad greens, and later in the season pumpkins, winter squash, sweet corn, string beans, tomatoes, and peppers. Bob is what I would consider a farmer out of the old tradition – no corporate farming going on here! He and his family started their farm in Ashland, New York in 1984 with 40 milking cows – selling their raw milk to the Dairylea Cooperative. In 1998 they decided to switch over to growing vegetables “because they’d lose money slower with vegetables”!!! Over the years he’s developed a wholesale customer base of local restaurants, the Kingston and Woodstock Farmers’ Markets, and the Culinary Institute of America in Poughkeepsie. His favorite outlet, however, is still his own personal farm stand in the front yard of his home. If you want to go for a visit, you’ll find his delicious produce on Route 23A in Prattsville, New York. Best time to visit would be late summer! For more info call 518-299-3198.